Everyone should try virtual reality, and thanks to Google Cardboard, nearly everyone can. All you need is a smartphone and an affordable Cardboard headset. Compared to the Oculus Rift, HTC Vive, and Google Daydream View headsets this will cost you a lot less, especially if you already own a compatible smartphone. While Google Cardboard is in no way a direct competitor in terms of performance with the big players in VR, there's still plenty of fun stuff to do. 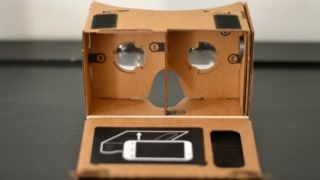 Once you get your hands on (and head inside) a Google Cardboard kit, you're going to need some apps and games. There's a solution to every problem, and we've solved this one in particular just for you. Here are the apps and games available for Google Cardboard that you need to check out. And best of all, these are all available free of charge. Wizard Academy is a shooting game set within a fantasy world that sees you take on the role of a magical professor shooting down different items in a variety of worlds including fire, ice and space. Sometimes you'll come across different interactive mini games that will test your memory and your hand-eye coordination too. Nevermind the silly name. BAMF VR is actually one of the more inventive and involved VR experiments available. Best of all, it's free. The game puts you through several challenging obstacle courses that you'll need to think your way through. Teleport from platform to platform to make it through each of the cleverly designed levels. This is one to check out. While we're on the topic of 360-degree video content, it's hard not to mention YouTube. The app offers a growing amount of immersive videos to get lost in. Here, you'll find the zaniest ones that are sure to get a rise out of VR first-timers. For the videos that aren't shot natively in 360-degrees, you can now even watch all of those with the Cardboard equipped. Much of what this app has to offer has little to do with VR, but there's some fun to be had for die-hard Star Wars fans. After clicking on the "Jakku Spy" Cardboard setting, there are nine different snippets of video that you can watch, complete with full-on production value and familiar sound effects. Fulldive gives you a VR-view of all of your content, including the photos and videos stored on your phone. It's an awesome, new way to look at your stuff. Additionally, you can browse YouTube and surf the web right from the app. Many apps can do what Fulldive does in piecemeal, but why not opt for the app that can do it all? Google's own app is a bit different from the others. Have you ever wondered how VR developers make their experiences fun and natural to use? Then this app is worth looking at. It breaks down the guidelines of what makes for a good VR experience into simple language and presents it in vividly designed presentation. Probably the best-looking title on this list, Voxel Fly VR blends the striking, colorful aesthetic of Mirror's Edge with a futuristic take on Frogger. The only difference being that you're placed into a cockpit of a ship and facing a fleet of flying cars head-on. Have fun! This game is an endless runner, of sorts, that puts you into a spacecraft with enemies hot on your tail. It's a lot like Temple Run in that you collect boosts and other goodies to outsmart the baddies, but it's wrapped in a futuristic style that makes this one hard to put down. Within is a hub for high-quality 360-degree video content. You'll find a nice assortment of things to watch, such as experimental short films, concert events. Plus, you can step behind the scenes of some Saturday Night Live productions. New content is being added on a semi-frequent basis. Flying through space is awesome, until you encounter the asteroid belt. In Vanguard V, tilt your way through the obstacles with a space ranger decked out in a style that calls back to Zone of the Enders. Need I say more?